Ted Lipien was formerly acting VOA associate director and helped to place BBG-funded radio and TV programs on stations in Russia, Ukraine, Georgia, Bosnia, Afghanistan, Iraq and in other countries in the region. He is the author of a book about Pope John Paul II and new feminism, in which he discussed the attempts by the Polish communist secret police and the KGB to spy on the Polish pontiff and feed disinformation to Western journalists. 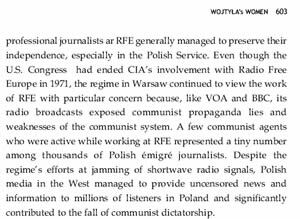 He also described how communist agents tried to infiltrate U.S. radio stations broadcasting to audiences behind the Iron Curtain. He points out in his book that the main targets of the communist secret police blackmail and recruitment efforts were journalists, intellectuals, extremists of all types, and priests. He worked in Washington, D.C. and spent eight years as a regional media marketing director for the BBG based at the RFE/RL headquarters in Prague. Ted Lipien has written an incisive and penetrating book on the role remarkable women, played in shaping John Paul II’s outlook on important and controversial issues that defined his papacy. One of them was the Albanian-born nun and Nobel laureate Mother Teresa. Much of the ground that Lipien covers in his meticulously documented book is not familiar to students of John Paul II’s papacy. He presents new information on the Pope’s enduring relationships with women who had an enormous impact on his life, offers original interpretations, and makes a significant contribution in advancing the theoretical discussion on John Paul II’s papacy. 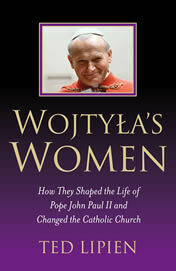 The greatest strength of “Wojtyla’s Women” lies in the author’s impassioned analysis of astonishingly complex issues and events. Lipien’s landmark book opens new paths for other scholars and is essential reading for specialists as well as the wider public. Extremely detailed research into a heretofore unexamined aspect of the beloved Pope John Paul II’s life. This book is worthwhile reading for anyone interested in the personal network of highly influential women who shaped John Paul II’s attitudes, particularly on the debate of women’s roles. An important book. Few persons are as qualified as Ted Lipien to enlighten readers about Pope John Paul II’s Polish roots — and the impact that they had on his views on women. Lipien provides a stimulating analysis of the Pope’s ideas on gender roles and how John Paul believed the Church should deal with sexual issues. While he does not agree with many of the Pope’s stands on women, Lipien makes a laudatory effort to understand — and explain — them. This book is a must-read for anyone interested in the relationship between feminism and Catholicism, a key issue of our times.